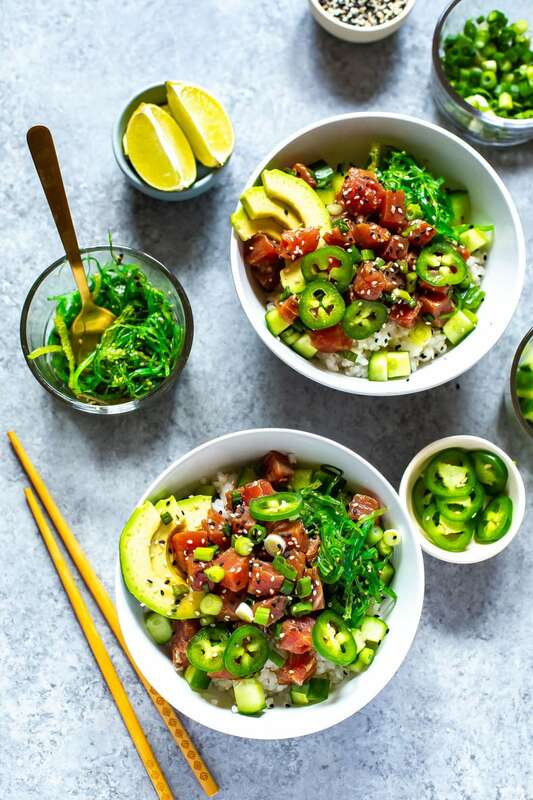 This 30-Minute Ahi Poke Bowl is a quick Hawaiian-inspired recipe with marinated tuna, sushi rice, avocado, and seaweed salad. It's just like takeout made easier at home! Poke (pronounced POH-kay) is a popular Hawaiian dish made up of rice, raw fish, veggies, and Asian-inspired flavors. 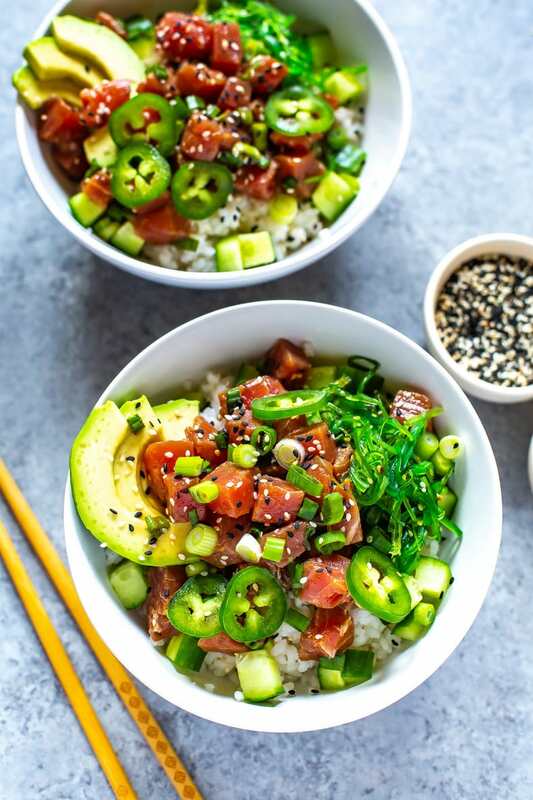 Most people more closely associate poke with sushi and Asian dishes as opposed to an island-inspired recipe since seaweed, sushi rice and raw sushi-grade fish are often the star of most poke bowls. Typically, the fish in a Poke bowl recipe is either raw ahi tuna or salmon. 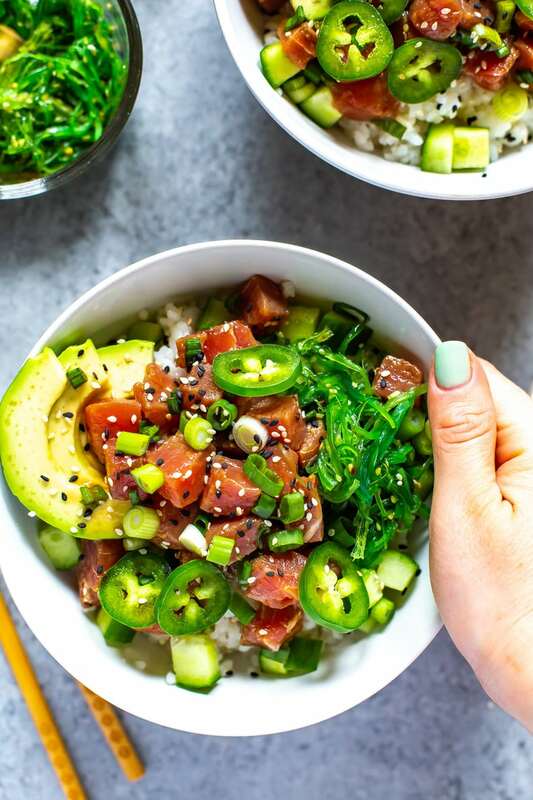 To make this ahi tuna Poke bowl, be sure to use raw tuna steak that you marinate in a mixture of soy sauce and sesame oil – this is the most traditional type of poke and in my opinion the most delicious! 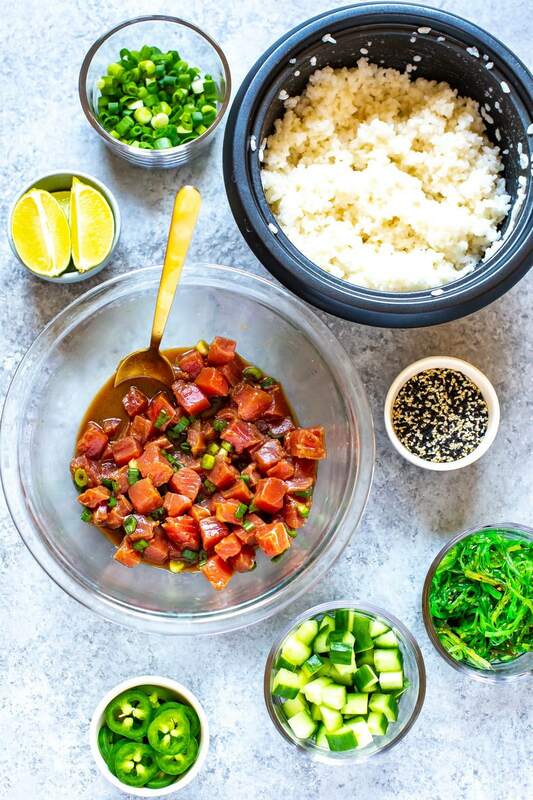 Most of the sauces in a poke bowl are made with a soy sauce or tamari and sesame oil base, with most sauce ingredients being pantry staples you should already have on hand at home. The tuna is marinated in the sauce and then you can add in additional sauces such as spicy mayo or an Asian-inspired vinaigrette for extra flavour. Personally, I find that the marinade serves as enough flavour and for the entire bowl and then I just drizzle a little bit of extra soy sauce overtop along with some sriracha if I'd like some spice but you can get creative with what you add to your poke bowl! If you need this ahi poke bowl to be gluten-free, substitute tamari for the soy sauce. You can also use cauliflower rice in place of the sticky rice to make it low carb. This is such a versatile recipe that can be altered to fit any diet! The rice in this ahi poke has a seasoning of rice vinegar mixed with a small amount of sugar and salt. That is traditionally how sushi rice is seasoned but you can certainly leave out the seasonings out if you prefer plain rice. Is raw tuna safe to eat? If you have never eaten raw fish before, the thought of doing so may seem intimidating, perhaps even scary. Thankfully, with the growing popularity of sushi dishes, finding fish that is safe to eat is easier now than ever before. Without going into too much detail, it’s important to understand that consuming any raw meat or seafood carries a small risk of foodborne illness. Then again, so does crossing a street full of busy traffic. If you want to know more about the topic, there’s a very interesting article on consuming raw fish on the Serious Eats website. In the article, they share an interview with a New York fishmonger, Yuji Haraguchi. He believes that the words “sashimi grade” and “sushi grade” tuna are very misleading. In fact, he says they are nothing more than a marketing ploy to make raw fish appear “safer”. The United States FDA states that if you’re going to eat fish uncooked, you should purchase frozen fillets. Apparently, that process kills off the parasites that exist in some species of fish. 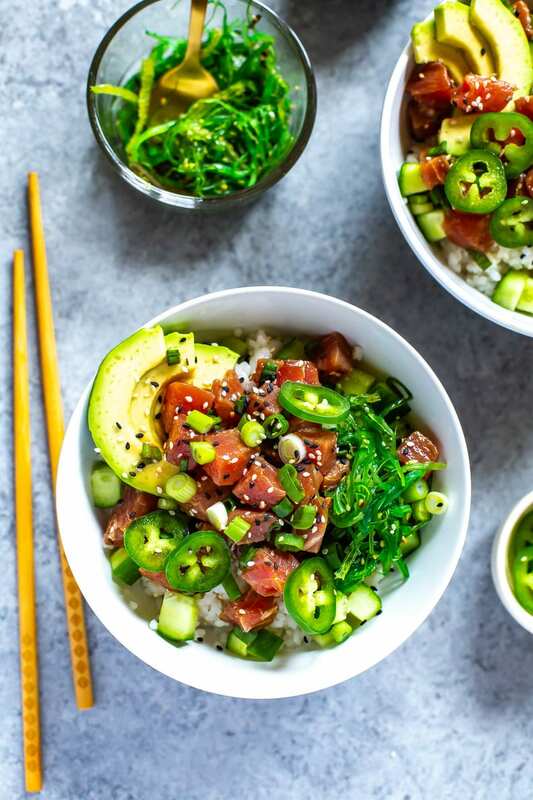 The GREAT news is, you don’t need to be concerned at all about parasites when you buy the tuna steak for this 30-minute ahi poke bowl recipe. Why? Because tuna doesn’t carry those parasites! So go ahead – make this tuna poke bowl recipe and ENJOY the heck out it! Part of the fun of a poke bowl is garnishing it with a lot of color and deliciousness. Feel free to swap in whatever veggies you enjoy and leave out the ones you don’t. For meal prep I like to clear out my vegetable crisper and use up any veggies that are going to go bad so often I'll add in some bell peppers, sliced cabbage, corn or edamame to these bowls as well. Even leafy greens work as a nice addition and add some extra nutritional value. Check out these other delicious meal prep ideas in case you can't get enough of sushi and poke! These types of recipes are SO easy to make at home and as long as you make the rice in a rice cooker, you're looking at a 30-minute meal prep since you don't have to cook the seafood! These cold dishes are also perfect for dinner on hot summer nights when you just don't feel like turning on the oven. 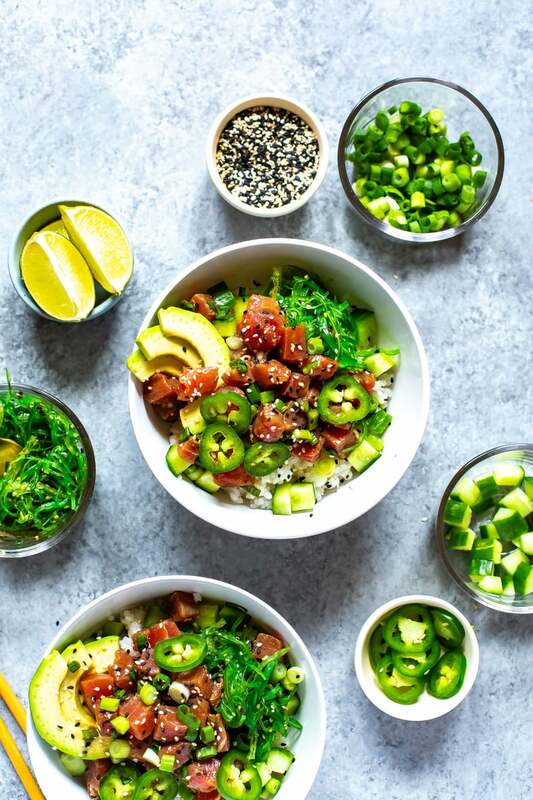 Grab some glass meal prep bowls if you plan on turning these 30-Minute Ahi Poke Bowls into your weekly lunches. This recipe in particular is great if you're planning on making more than one meal prep recipe in a week since it will only stay good in the fridge for 3 days. 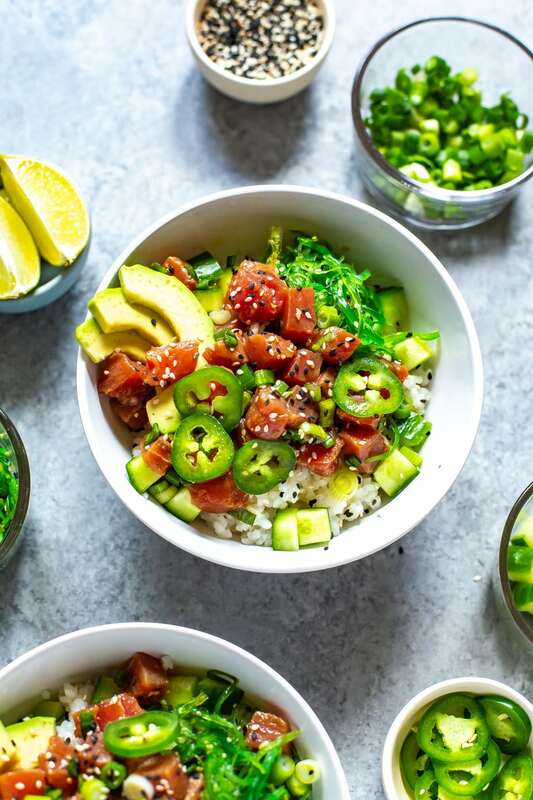 If you'd like a little more variety in your meal prep plan for the week, whip up these quick poke bowls and eat dinner leftovers the rest of the work week. 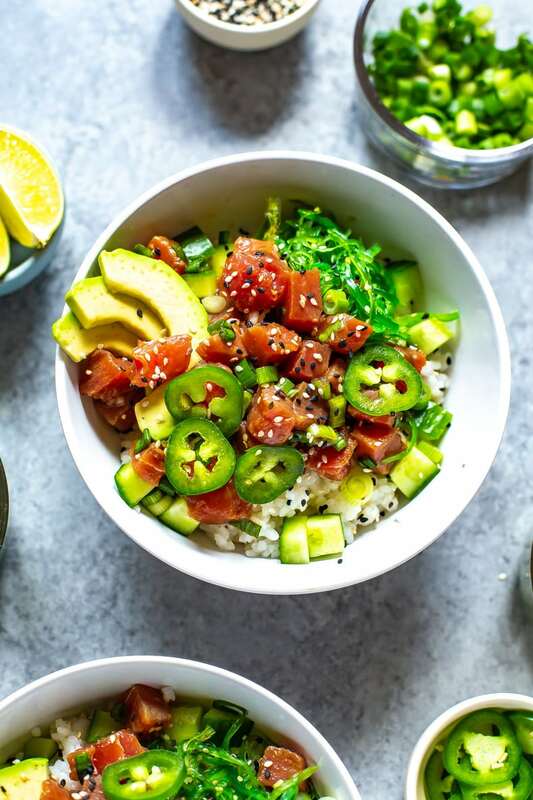 This 30-Minute Ahi Poke Bowl is a quick Hawaiian-inspired recipe with marinated tuna, sushi rice, avocado and seaweed salad - it's just like takeout made easy at home! Dice up tuna and toss with poke marinade ingredients in a large bowl. Set aside and let sit for 15-20 minutes in the fridge. To make tuna easier to slice (optional), freeze for 30-60 minutes or so before slicing. Meanwhile, cook rice, water and butter together in a rice cooker. Let cool, then stir in rice vinegar, sugar and salt. Rice can be made up to 2 days in advance and is best served cold. When ready to serve, add tuna poke on top of cool rice and add whatever toppings you desire. Enjoy!